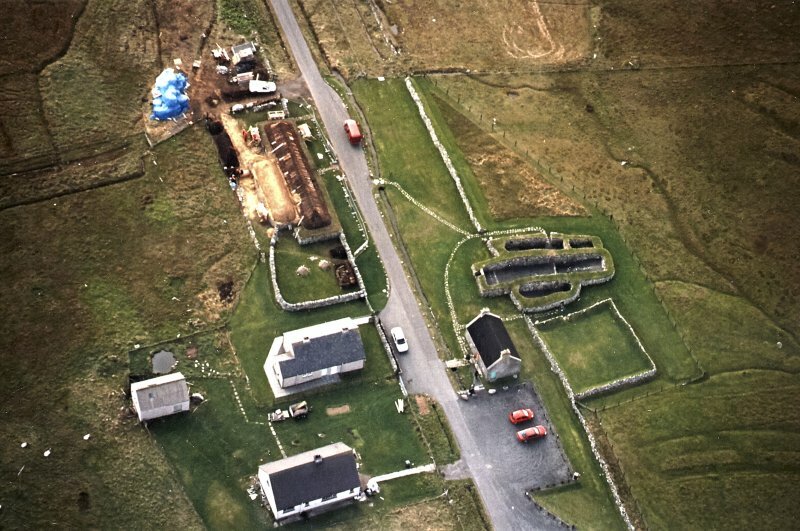 Oblique aerial view centred on the re-roofing of the museum with the remains of the blackhouse adjacent, taken from the SE. 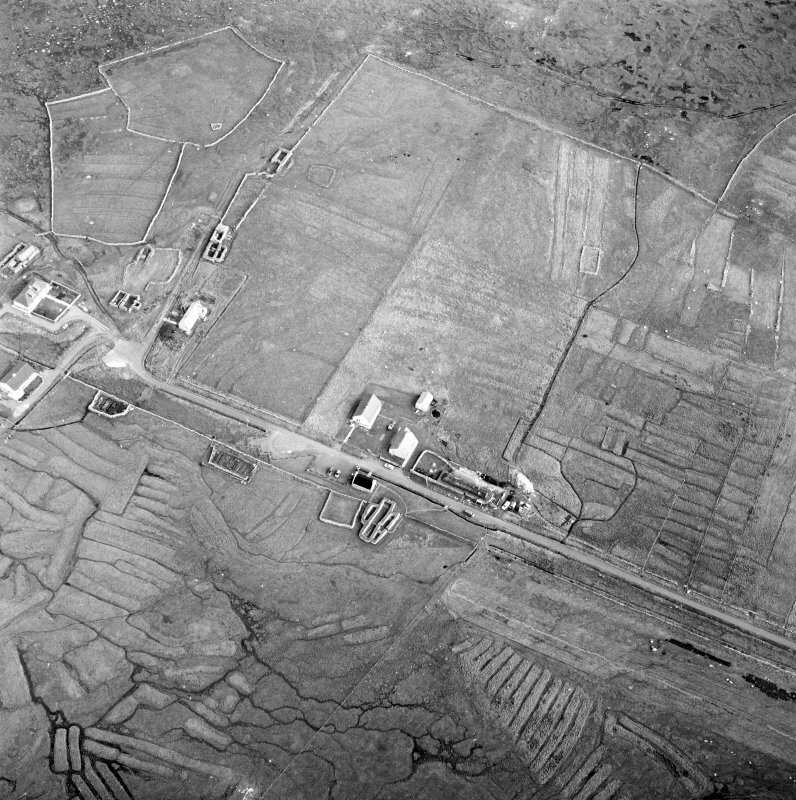 Oblique aerial view centred on the re-roofing of the museum with the remains of other blackhouses and lazy beds adjacent, taken from the W.
Oblique aerial view centred on the re-roofing of the museum with the remains of other blackhouses and lazy beds adjacent, taken from the NW. 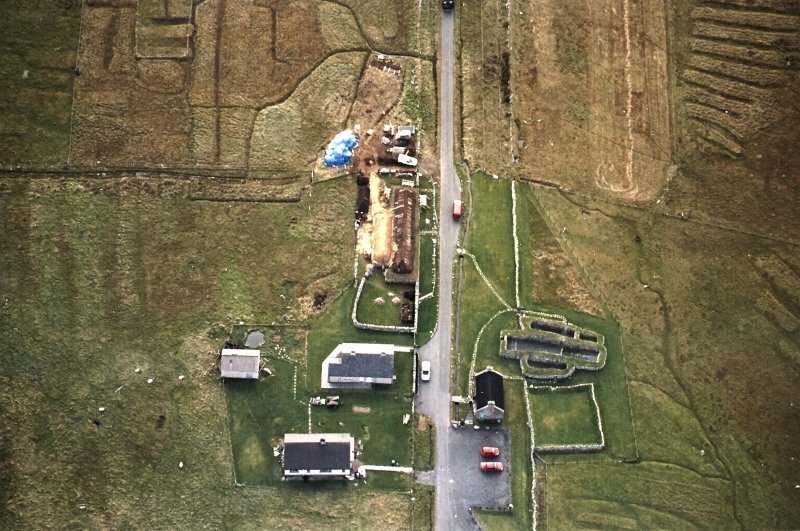 Oblique aerial view centred on the re-roofing of the museum with the remains of the blackhouse adjacent, taken from the NNW. 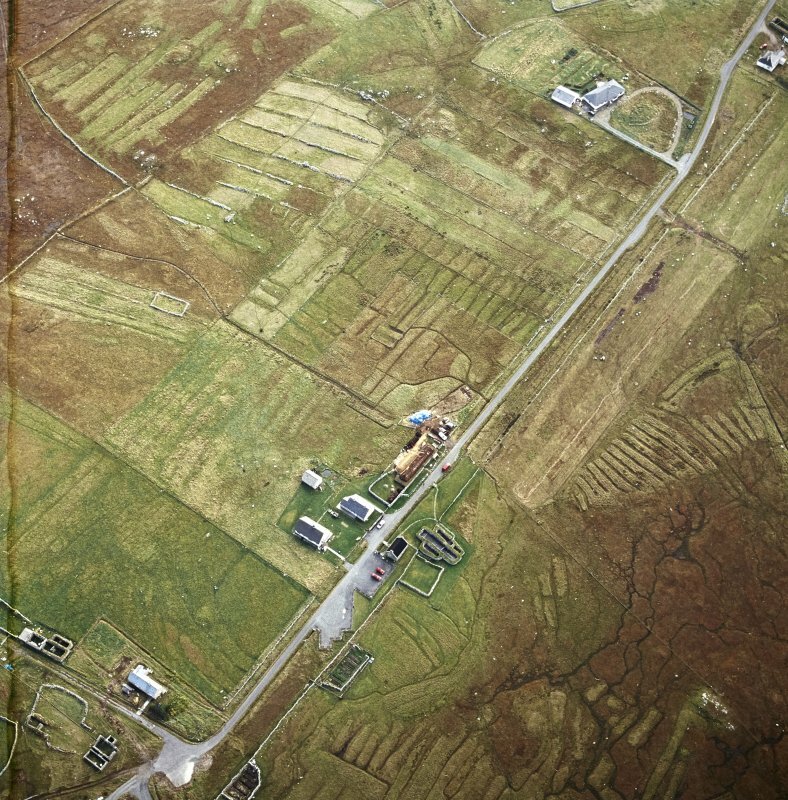 Oblique aerial view centred on the re-roofing of the museum with the remains of the blackhouse adjacent, taken from the N.
Oblique aerial view centred on the re-roofing of the museum with the remains of other blackhouses and lazy beds adjacent, taken from the WSW. Extract of OS 1st edition map, Ross-shire, Island of Lewis, sheet 8. May have been digitally enhanced by alteration to text or lines. Digital image only. 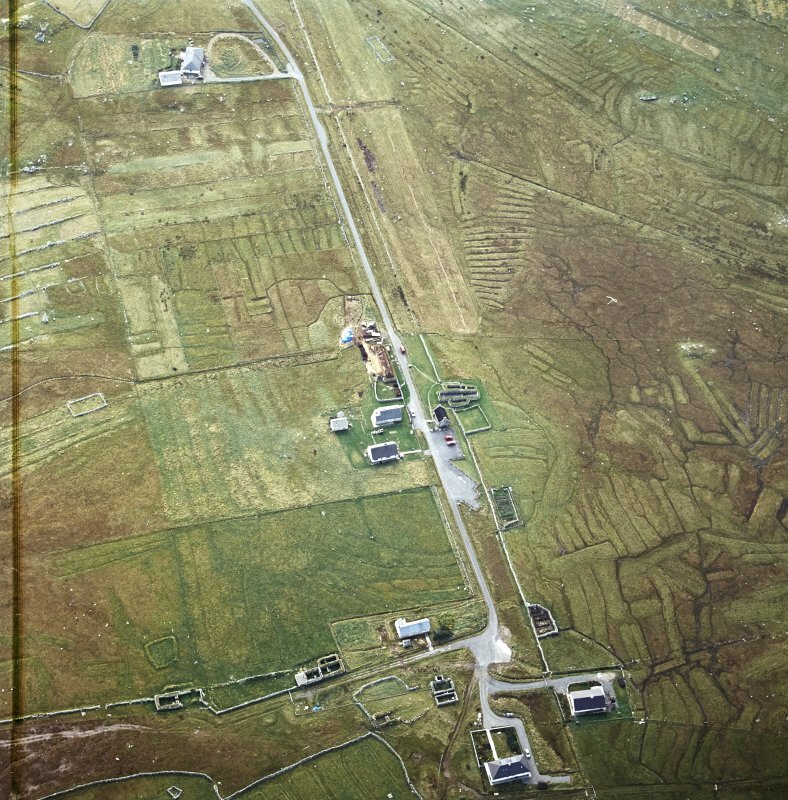 Cover Illustration from "But the Walls Remained"
Oblique aerial view centred on the re-roofing of the museum with the remains of other blackhouses and lazy beds adjacent, taken from the NNE. 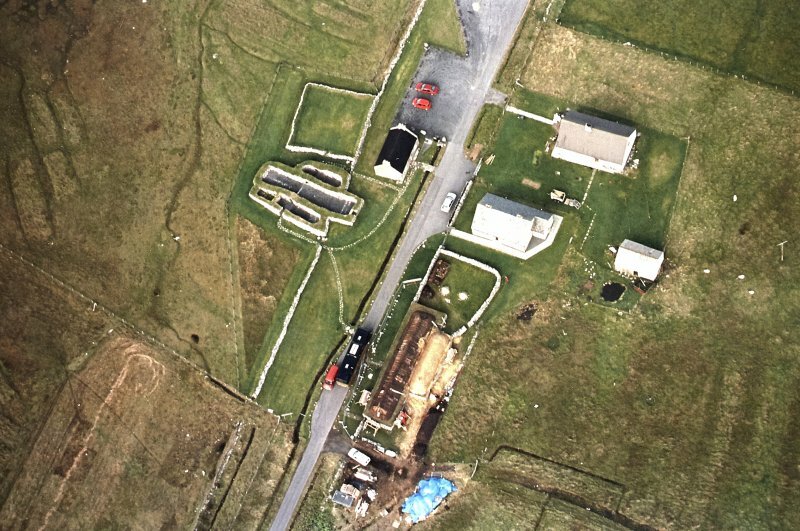 Oblique aerial view centred on the re-roofing of the museum with the remains of other blackhouses and lazy beds adjacent, taken from the ENE. 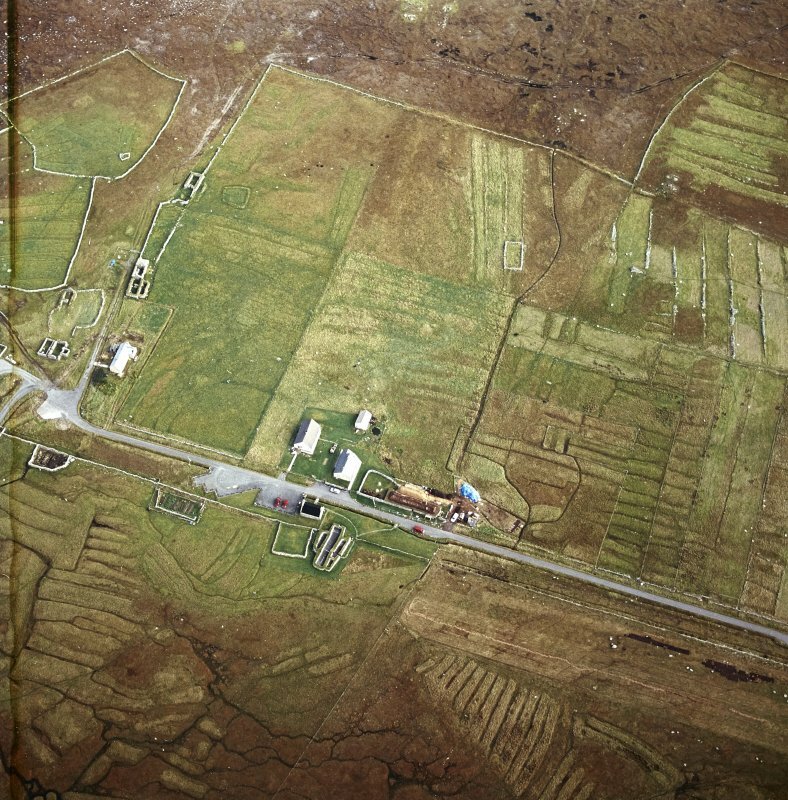 Oblique aerial view centred on the re-roofing of the museum with the remains of other blackhouses and lazy beds adjacent, taken from the N.
No 39 Arnol, 1920s Typical island 'white house', preserved as a museum beside the roofless blackhouse it replaced. Although superficially less primitive, these concrete and asbestos-tiled boxes never really caught on with the local population, who remained sentimentally, if not physically, loyal to the old houses. Historic Scotland. NB 310 492 Limited excavation of floor surfaces and wall sections together with detailed recording of standing masonry have allowed a comprehensive history of the development of the building to be produced. Although occupied as a dwelling for a relatively short time between the 1880s and 1920s, the building was modified many times. The original structure seems to have been constructed to the same basic pattern as that seen today, with its three adjoining rooms - the barn, byre/dwelling, and porch or fosglan. Since then both the dwelling area and porch have been significantly lengthened. The extension to the porch proved to be unstable and eventually collapsed. As a result of this the whole western end of the porch was separated off from the remainder of that room by a partition wall. The eastern end of the dwelling area was reconstructed at some point in the early 20th century in order to accommodate a window. The excavation of the internal area revealed several different floor types and features such as loom platforms, many of which probably relate only to the later phases of occupation. Sections through the floors of the three main rooms, one of the main walls and at several points across the wall-head, have provided detailed information regarding the methods used in the construction of this and other similar buildings in the vicinity. NB 310 490 (centre) Further excavation at the blackhouse at No 39 Arnol revealed a series of early floor surfaces and further evidence that the building had been considerably modified during its lifetime (Holden 1998). The original step between the byre and the living area was identified revealing that this had been rebuilt further into the byre which was, in turn, extended to the W. The central hearth of the original build was also identified. A number of later features, notably a loom platform relating to the post-habitation phase of use, were also removed prior to the initiation of restoration work. A survey consisting of descriptions with measured sketches and photographs was made of all surviving blackhouses in Arnol - 43 in total. 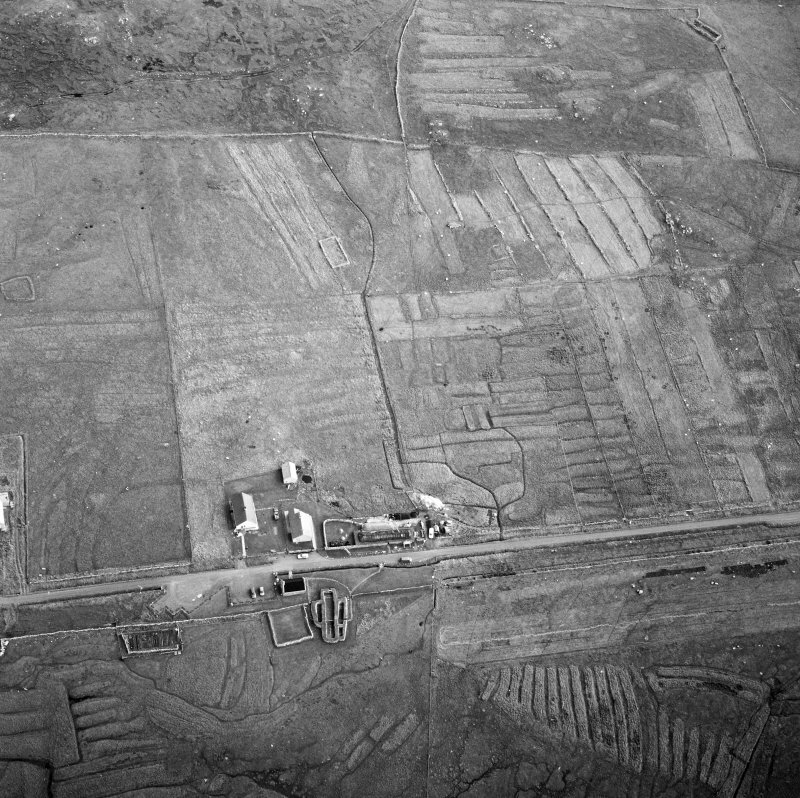 Several different phases of construction were identified. The earliest, now represented only by stone and turf footings, were constructed in the mid-19th century and consisted of several parallel cells with rounded corners. This pattern is developed through the rest of the 19th century with newer houses being constructed on different alignments closer to the present road. The most recent buildings comprised large, square-cornered rooms with gabled end walls, constructed of split boulders. A number of the latest examples have single or double storey whitehouse extensions. 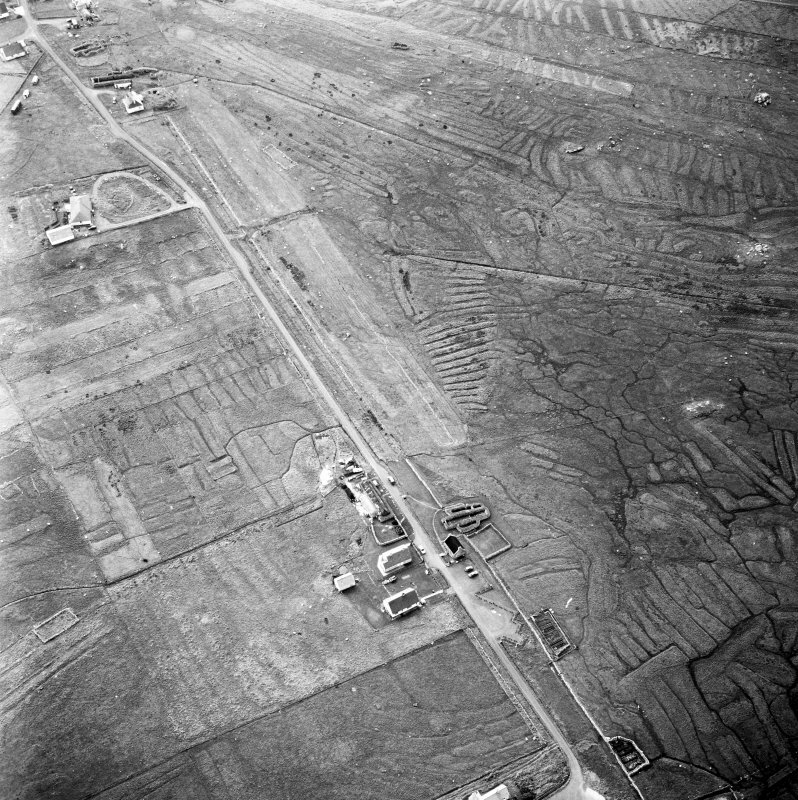 A detailed EDM survey was also made of all visible archaeological features in the area between the present township and the coast. 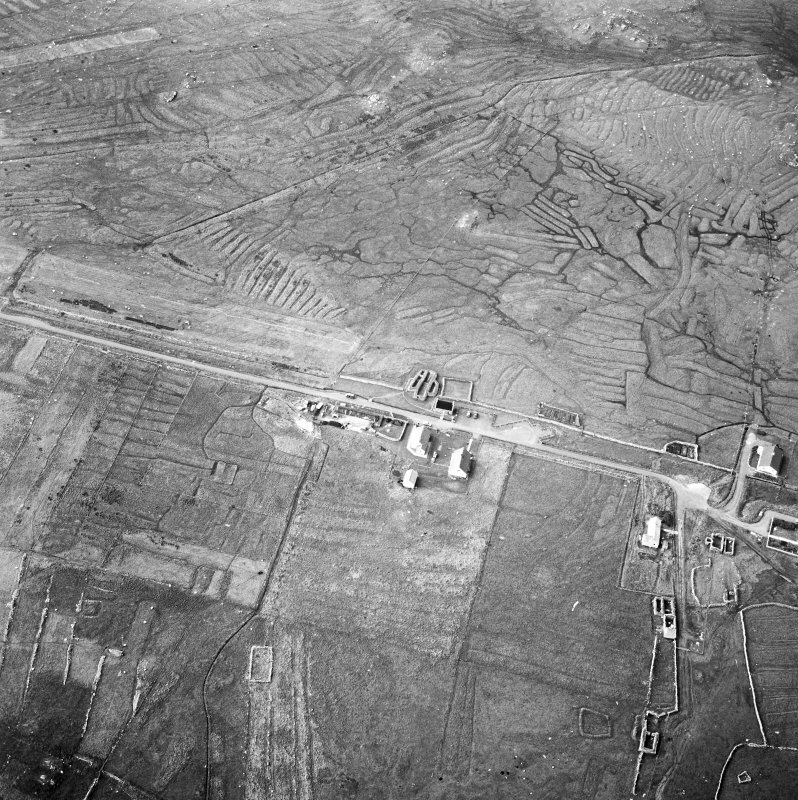 Buildings associated with early 19th-century crofting alignments were identified, as were a number of structures from Old Arnol which is known to have been located on the coast. Other features of earlier date were also identified in sections of eroding beach deposits. Fragments of pottery from these have been identified as being broadly Iron Age in date. Scheduled as Arnol, blackhouses no. 39 and no. 42 and associated croft houses. Information from Historic Scotland, scheduling document dated 28 February 2000. NB 310 492 A short period of archaeological monitoring was undertaken in February 2004 at the Brown House at Arnol (NB34NW 2.15) during the excavation and re-establishment of a French drain surrounding the property. There were no finds of archaeological importance.